A highly localized (EOO <100 km²), but locally common species known from two locations. It is potentially threatened by habitat loss to mining and erosion. The most severe threat to plant species in the Richtersveld is severe overgrazing of communal rangelands, which has led to a loss of plant species diversity and shrub cover across large areas of the Richtersveld. Both known subpopulations occur in severely overgrazed areas. At one site, there has been a near-complete loss of shrub cover. However, in spite of such severe habitat degradation, the subpopulations appear to suffer no ill effect. Many Moraea species are unpalatable and/or poisonous to livestock, and can thrive under conditions of severe overgrazing. Widespread loss of vegetation cover has the additional effect of exposing soil to erosion, and in overgrazed areas, flash floods occur more frequently and cause increasing damage during periods of heavy rainfall (P.C.V. van Wyk pers. obs.). Moraea teretifolia is therefore potentially threatened by habitat loss to erosion. 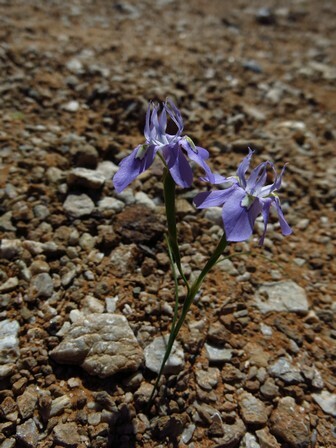 Areas to the north of the population is extensively degraded due to open-cast mining, and pile-ups of windblown sand from exposed mine dumps are burying dwarf species such as this one. Expansion of mining is another potential threat which could lead to habitat loss and degradation for this highly localized species. This species is common around the base and lower slopes of the Ploegberg (P.C.V. van Wyk pers. obs. ), and another smaller subpopulation occurs at the base of Cornellskop. As it is abundant even in severely overgrazed areas, the population is not suspected to be declining. 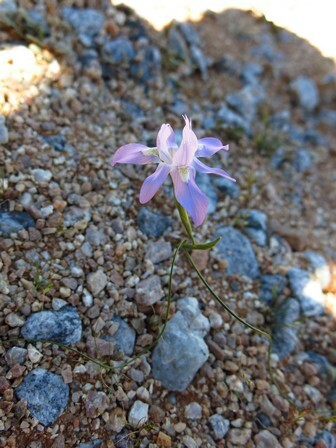 This species was only recently separated from the widespread and common Moraea saxicola (Goldblatt and Manning 2014), and it is possible that it may be overlooked elsewhere in the Richtersveld due to misidentifications.